That's correct - my '65 365 A/C Tanker didn't have the vent fan. My '64 AC Coupe has a functional 3 speed fan, it shuts off when the AC is turned on. I normally can't hear the fan running as the N11 exhaust and the L76 engine mute it out. The Video shows the high 3rd speed setting on the pull ****. The 36 gallon fuel tanker would block the inlet for the fan so there's no way for the fan in those cars! Last edited by mjdart; 04-08-2019 at 06:20 AM. I like that feature in my 65. I’m sure it was discontinued because it didn’t move enough air to justify the cost, but, IMO, if it moves any air at all it’s gotta help! The term astroventilation did not become known until Chevy did away with the vent windows. Purposeless in 1963, the coupe's so called air outlets behind the doors were restyled and made functional in 1964, at least on the driver's side, where an electric ventilation motor, located in cramped quarters behind the left rear wheel-well, tried somewhat vainly to push out the 1964's bad air. A nice idea, but it was severely limited by the small, three speed motor's weak lungs. The equipment was deleted after 1965. Wonder if you could replace the motor with a stronger one. There's no need to. The rear blower uses the same size motor and fan that's in the heater. In a correctly operating system, it moves as much or more air than the heater. The video posted above by mjdart shows how they are supposed to work. That was a cool way to show the vent working (no pun intended). Thanks for posting this. That system is a lot bigger than I imagined. I can see why the pencil pushers were happy to have it gone with the wind. Is that a drain port in front of the rear wheel? The one thing no one has mentioned is why it moved so little air at all speeds. 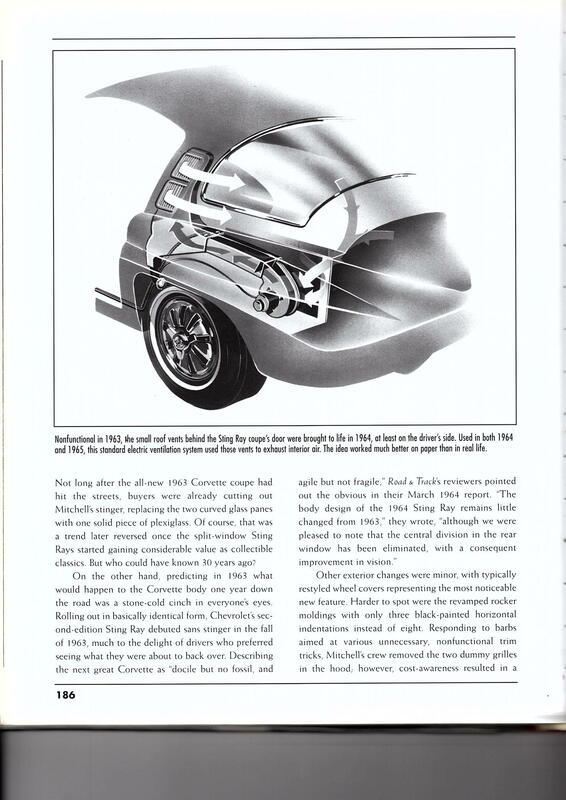 Number of years back there was a write-up in one of the Corvette magazines I subscribed too, where a gentleman was trying to find out why, although the fan had three speeds, it only ran on low speed in all positions. He started looking at wiring diagram and found GM had made an error in wiring diagram that if I remember correctly did not allow the fan to run at higher speed when medium and high positions were selected. He figured out the correct wiring needed to make fan run at the 2 higher speeds by, if I remember correctly grounds for those two speeds were not connected, so that when selected fan motor would speed up and pull more air out of interior compartment. The wiring problem was on board located back, that fans wires connected too. Think this was around 2008-2010 time frame. I know at time the 64 I purchased did not have the rear fan in it, so I picked one up down in Orlando at Old Town show because of artical. 1st time I ever saw Frank's C1. Also still have it, as I went Restomod with car. May even have two, as I think the 2nd 64 coupe I bought has one in pile of parts that came with it when I was unloading them around 4-5 years when I bought it. He started looking at wiring diagram and found GM had made an error in wiring diagram that if I remember correctly did not allow the fan to run at higher speed when medium and high positions were selected. He figured out the correct wiring needed to make fan run at the 2 higher speeds by, if I remember correctly grounds for those two speeds were not connected, so that when selected fan motor would speed up and pull more air out of interior compartment. The wiring problem was on board located back, that fans wires connected too..
That article was from Kevin MacKay (owner of Corvette Repair in New York), and was published about 20+ years ago; the wiring from the factory was correct, but there was an error in the factory wiring diagram which would result in a one-speed fan if you used the factory diagram as a reference to make a harness or diagnose a problem. Maybe so, but obviously it’s not enough, so why can’t a stronger motor of the same dimensions be installed? Are there supposed to be open vents where cabin air is drawn into the motor? Last edited by 59BlueSilver; 04-11-2019 at 10:51 PM. Cabin air is drawn into the fan housing through the bent piece of chicken wire screen at the back end of the driver's side rear quarter inner panel carpet, and exhausted through the output duct to the roof vents. See attached DZ file. Yes, found it. I had to get way in the back and I could see the screen. Still think it’s a good design, just like to know how to improve it. front window trim,(took 6 hours) what next?